Polk County is a small, rural county located in the North Carolina Foothills, bordering South Carolina. The county seat is Columbus, but its largest town is Tryon. Polk was not named after President James K. Polk, but rather after a William Polk who was a colonel during the Revolutionary War. It is lightly populated, with only about 20,000 residents. 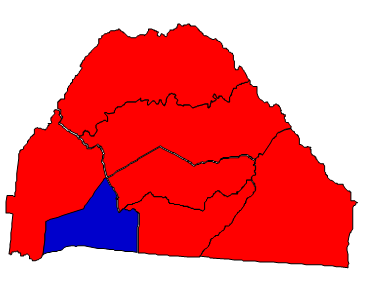 The eastern two-thirds of the county is part of the Piedmont Region; the western third belongs to the Blue Ridge Mountains. The steepest railway grade in the U.S., known as the Saluda Grade, is located here. Politically, Polk County votes Republican in presidential elections and downballot. It is overwhelmingly white, about 90% as of the 2010 census. There is some lingering Democratic support, but this is steadily eroding. Republicans even hold a lead in voter registration. In 2008 Polk nearly voted for both Bev Perdue and Kay Hagan, but ultimately fell into the Republican column in both races. In 2012 Polk gave Mitt Romney over 60% of the vote. Forecast: Polk County’s voters are by and large conservative, although a small liberal element exists in Tryon. They tend to back socially conservative candidates, but many of these same voters struggle financially and will vote against Republicans if they blame them for a bad economy. This happened in 2004, when many Bush voters in Polk County switched to John Kerry. But four years later, despite an even worse economy, Polk gave John McCain a bigger margin than Bush. If lightning strikes, Polk County will vote for the right Democrat, Heath Shuler comes to mind. Barack Obama is exactly the wrong type of Democrat for places like this. In fact, he even underperformed Walter Dalton last year, though at least part of that is probably due to Dalton’s home county of Rutherford being right next door. Hillary Clinton would improve on Obama’s performance in 2016, as would just about any other Democrat. However, it takes an exceptionally rare type of Democrat to win Polk County, and it’s not going to happen at the presidential level any time soon. The growth rate here in the 2000s was 11.93%. If population estimates for 2012 are extrapolated to 2020, then a net reduction in population is expected by the next census. The county is trending Republican, due to an increase in support from economically downscale whites.